It was with great expectation that I awaited the completion of the green in front of the new Overcash Academic and Performing Arts Center at Central Piedmont Community College. What possibilities! A large open space on the edge of Uptown…a gateway to the campus… a haven of green amongst the red bricks and striped crosswalks. It is not often a city sees such an opportunity so close to its center, to create along with the construction of new buildings an open space that could also serve as a gateway to the central city. The new buildings, which are part of a multi-year building program, are themselves a letdown. 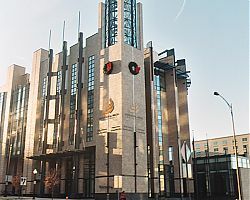 As construction slowly marched down Elizabeth Street and each new structure took form, it became apparent that the designers, Little Diversified Architectural Consulting, and the college administration, had averted their eyes from a vision of the future to instead dreamily gaze upon a gilded portrait of the past. The past in the style of classical architecture was once again revived (or rather resuscitated) to wrap a new academic institution in a toga of classical orders and ornament to give an impression of history and tradition. The “long train” of the neoclassical Overcash building has an impressive engine, but no caboose; there is no modulation of the massing to keep the eye from falling off the 4th Street end. Past architectural styles, when adapted and modified with imagination and skill to building uses of the present can produce admirable results. But the language of classical architecture has not been effectively used to break up the long elevation facing Kings Drive with smaller colonnaded pavilions or similar devices. Instead, the monumental entrance is out-flanked by a monotonously repetitious wing. The material palette of Overcash, red brick, white mortar, precast sills and column enclosures is repeated again and again with little variation in the other “new” buildings on campus such that they don’t have character which differentiates one from another. The question arises again, why build a new school in an old style, poorly rendered? This elevation of the building along Kings Drive is the backdrop for the new much- anticipated green. Alas, hope was dashed with the installation of the bombastic, overwrought cyclone of bronze now ensconced in front of the Overcash Building. Created in the tradition of allegorical sculpture, this piece abounds in outstretched wings, flowing garments, and figures balanced precariously one atop the other. All the potential of the surrounding open space seems to have been sucked up into this vortex of bronze, leaving only a flat field of uninviting brown stubble. What could have been a gathering space for students is now a sterile setting for a grandiose sculpture. Compare this wasted opportunity at CPCC with the new Johnson and Wales campus on the other side of town. 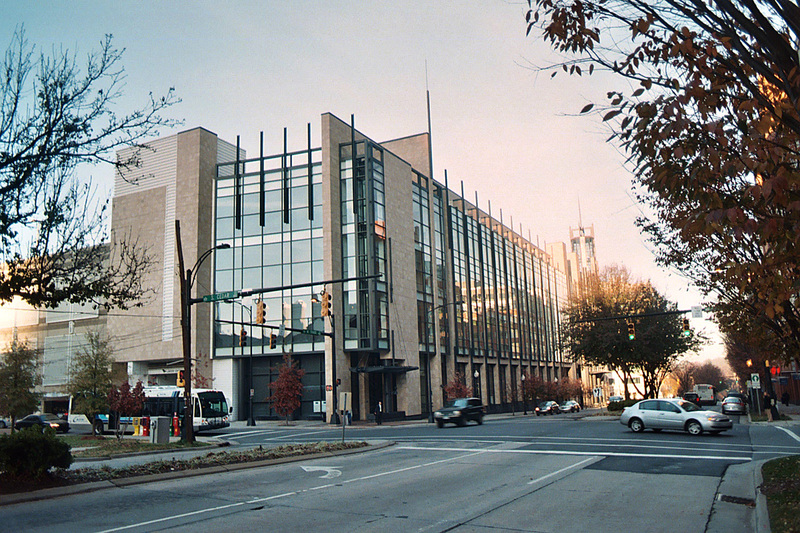 Here, the new Academic Center on West Trade Street, designed by LS3P Associates LTD, is sheathed in subtle shades of brick and stone and expanses of glass, creating original abstract forms in a modern, urban interpretation of the academic gothic architecture seen on many older American and European campuses. The long elevation along Trade Street is broken up by masonry-clad pilasters into a series of tall and narrow bays, culminating at the northern corner with a tower and ground-level portal opening onto a green “yard.” Walking through this portal, one is greeted by a park-like green which is bestrewn with inviting seating that attracts students to sit and socialize throughout the day. This building and open space becomes a backdrop for student activity. Large windows on the corner of Trade and Cedar Street allow passersby to observe students at work in the ground floor bakery and serving hall above. The art and architecture here does not become assertive and overpower the open space, as does the multistory colonnade of the Overcash building. The design at Johnson and Wales uses brick, steel, and glass to create spaces that invite the public to view the activity within and in the courtyard outside. Steel cables and canopies have been detailed in an original modern vocabulary to create lively, dynamic facades. This building is a vital new presence in its neighborhood and city. So why in Charlotte do we return to the past so often for designs to decorate our new buildings such as Overcash, demolishing the old to build the contrived historic? Is it from guilt? Does this copying absolve us from the guilt of being such bad stewards of the authentic? This mining of the past has failed to bring to light features of the few old gems that survive just down the street: the Aunt Stella center; the Afro-American Cultural center, some of the old brick buildings in the Elizabeth District and on Tryon Street; and the exuberant Church at Spirit Square. These buildings abound in details and material features that enliven their exterior and enrich their neighborhood. They are good examples of how brick, masonry, and glass have been used to break up the long expanses of walls. These venerable structures are, for the most part, churches or cultural landmarks that have escaped the wave of demolition that has swept over Charlotte. Most of the older commercial and industrial buildings which give other cities their character and unique identity have been obliterated by a tsunami of development in this city and can now only be appreciated by looking at sepia-toned photographs in books or on the walls of the Charlotte History Museum. From the red earth of this cleared land has sprung up, more often than not, a paltry verisimilitude of what once stood, rendered in poorly-detailed thin plaster over Styrofoam, or a veneer of brick formed into arches, columns, domes or what have you. The design of the new Johnson and Wales building declares the vision of this college to embrace a modern design approach and innovative use of open space. 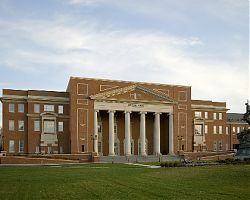 Not fettered by the almost reflexive use of red brick and neo-classical, Georgian allusion endemic in Charlotte, Johnson and Wales has made a new place in a new style. Instead of open space as a mere backdrop to a building and a setting for a sculpture, Johnson and Wales has created a dynamic enclosed open space used by students and a building that is a window to their activity. With this campus as an encouraging example, let us hope that instead of continuing to wrap its’ buildings in the comforter of well-worn styles, this city becomes emboldened to think afresh about the built environment to create architecture for people living in our time and this place. I could not agree with you more. In my 20 years living here I’ve seen buildings razed that should have been left alone and new “fast food” architecture replace them…sad. I sincerely hope Point 8 stimulates new thinking in our fair city and your article voices very well the stifled voices of many. We have all sold our souls to satisfy our clients. 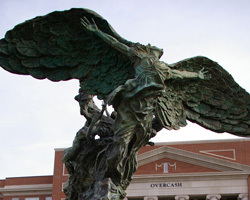 The easy answer to a client wish to be perceived as a new Chapel Hill is to copy from projects of the past. The harder path is the one that convinces the client that a new expression would help define part of a new mission of an urban campus to help bring new skill to the current work force. Thankfully there are designers like Pat Campbell and LS3P to back him up. Pat understands how to design an urban classroom building that speaks to traditions without copying the past. While I share your enthusiasm for J&W’s new Academic Center, and agree with your insightful description of what that project offers to its end of Trade Street, I think you are out of your depth in your criticism of CPCC’s Ovecash Building. 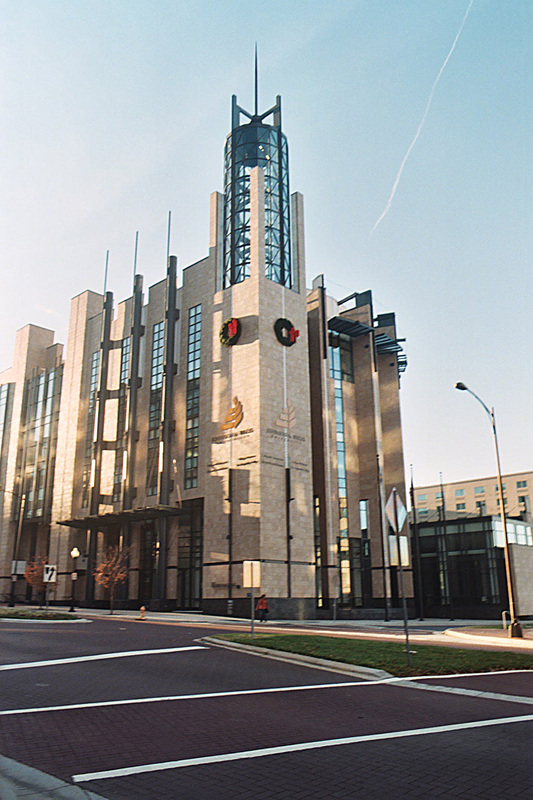 Is this really the most “poorly rendered” classical building in Charlotte or just the one that disapointed you the most because of its prominent site? Chapel Hill’s Playmaker’s Theater is beautiful indeed. 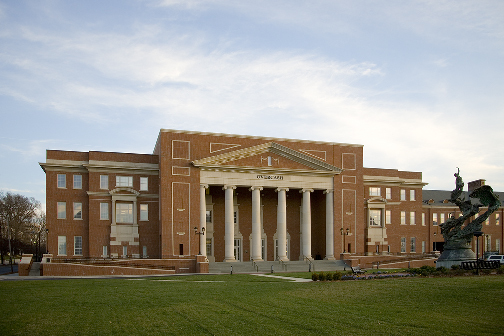 But should its beauty set the classical style beyond use for a new school, library, post office, or fire station? Forever?...or just for some respectful period of time? Over the preceeding 3 millenia, generation after genration of architects found new uses for classicism in their citymaking. But this tradition should—for Mr. Vonnegut—be cryogenically frozen? 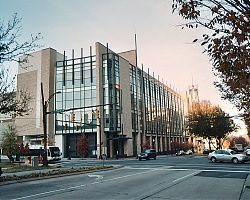 The designers of the Overcash Building set out to draw the best classical,red brick, stone trimmed, civic buildng that Charlotte architects have offered up to our fair city in a generation. I believe that we came close. If you are truely satisfied to class the Overcash with the rest of the dross of Charlotte’s red brick ’90s, then I also believe that yours is ulikely to be among the critical voices that move serious discussion about citymaking in Charlotte forward. Scott,your article brings some good points yet there are many intangibles that need to be recognize. I for one prefer modern architecture but apreciate and value architectural contrast. I personally prefer to see a good clasical design rather than a poorly executed EIFS blob, as we have here in Charlotte. I remain optimistic thought and as the city and clientele evolve too will be the dialogue towards good modern and progressive architecture. From my perspective it is as much about the client as it is about the valiant designer. This is not an LS3P , Little debate if it was a portfolio of work should be review since both firms have had their successes and tribulations. My elementary school daughter would choose Pink over any other color any time. She often asked me what my favorite color was. At those moments, I always found myself at defensive line trying to explain to her that I chose color depending on circumstances, because different color combinations deliver different messages. I could not agree more with Jeff on that it is not about bricks or glass, it is how you put them together. Architecture is a language used to proclaim passion and/or character of its master. Different styles are like different languages, which in themselves do not represent good or bad. The ability to speak a language however can be measured. That in my opinion should be the platform on which designers/buildings can be compared. The Overcash though classical in form speaks to the public about its linkage to Greek a very fitting reference in academia. It in itself is a very refined building with carefully crafted lines and proportions to accommodate the modern inside volumes. Charlotte is a relatively new city to me personally, and I find it fair indeed. I am optimistic that the city can speak of high language in modernism as well as in classicalism. 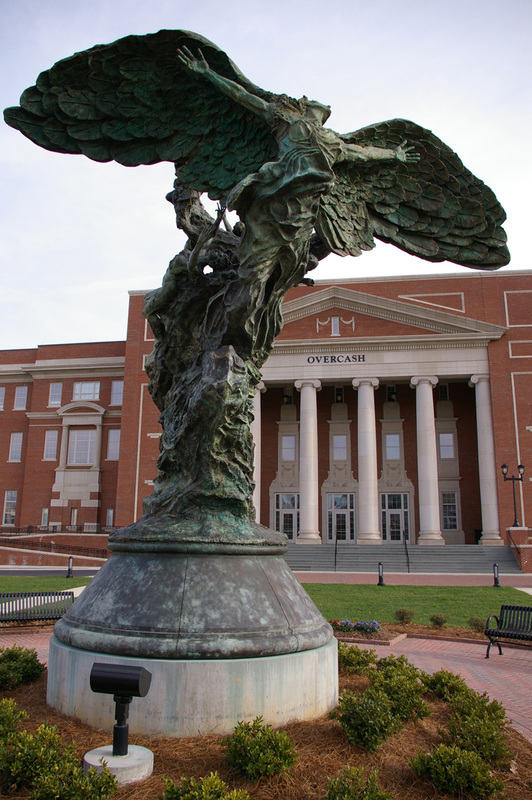 Scott, I feel that you spoke before you thought on the subject of CPCC’s Overcash building. This biased report is foolish at best. If you haven’t noticed, there is a movement to move back to the old styles in architecture, fashion, and home styles. Your opinion about this style is just that, an opinion. I am unsure if you have been in the Overcash building but it is beautiful. The outside is fresh and offers amazing columns and beautiful brickwork. The view off the front porch is amazing and the Halton Theater is the best in Charlotte, period. I personally believe the Johnston and Wales building is the most “poorly rendered” building in Charlotte. The brick, stone, and glass is sourly repetitive and too busy for the eye. Before you offer an opinion, think about it a little. I think your argument is moot considering both these buildings are horrendous.